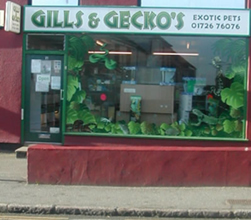 Gills and Geckos - Huge range of Exotic Animals. The one-stop shop for all your Exotic Animals, from reptiles to the more unusual mammals. Come and visit us in the shop and see what we have available from live food to rare breed animals. This is just a brief history about us. We have been keeping and breeding reptiles for over 15 years. It started as a single iguana, a wedding aniversary present for Nicky, and then grew into a large collection of snakes and lizards. Both Nicky and myself have a fascination for the wierd and wonderful exotic pets that are around. Mike worked in a Pet Shop for two years and then moved to become the manager of a local tropical fish importers. He fascinated Nicky with his knowledge of fish species. We have rescued reptiles from people who have been unable to look after them properly, or if they have lost interest in the animal. We have given a local primary school a tour of our house to educate the children when it began to cost to much to bring an animal educator into the school to educate the children. We hope that as well as being able to provide reptiles and exotic mammals to the public, that we will also be providing an informative service to them aswell. The name Gills & Gecko's came about because we are fortunate to have "Gill" as a surname!! With stocking fish and Gecko's, what else could it have been called? Our aim is that if you cant see what you want, we will try to find it for you. We hope that you have enjoyed our website, and that we will see you in the shop very soon!! !